I haven't been posting too many new recipes. Have you noticed? It's been a crazy busy summer and with all the parties, family reunions and barbeque's, I really haven't been up to cooking. 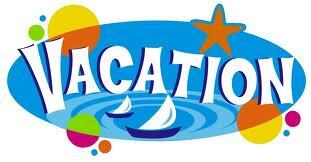 Plus, we decided to go on a huge summer vacation this year. We decided to trek all the way from Minnesota to New York. So I'm taking over my food blog and am giving you some highlights on our trip. It gives me something to do at night at the hotel plus this way I can record some of the memories. If you're not interested, you can come back in a week or so and I'll start cooking again. Maybe. We usually go on vacation during the summer but stick relatively close to home. We've visited Wisconsin Dells for several years in a row. Last year we took a trip up the North Shore. Still, only a few hours from the house though. This year, we made the commitment to drive to New York. I have several friends who have traveled to New York and usually do it in a week or 10 days. That requires a LOT of driving and some very long days in the car. It was doable but we decided to make it 2 weeks instead and make several stops along the way. Yup, that's 16 days of travel. That really is a long time to be away from home! The most we've done before was 7 days I think. So plans were made, hotel reservations booked and we were all set to go. 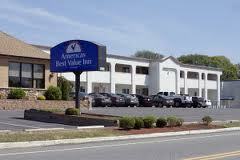 We ended up booking hotels at mostly America's Best Value Inn. They have decent hotels and have a value card membership that is free that saves you 15% on hotel stays. Several days before the trip, we offered to bring a couple of the kids' friends to Illinois to see their grandmother. The timing was perfect, they wanted to spend 2 weeks with grandma and we were going right through Illinois anyways. But could we get them into an already packed van? Well, it took some careful packing but everyone and everything fit perfect. It was a tight squeeze but everyone was happy and I was happy that we could help our friends. Friday night we took off for Madison. The kids had a blast partially due to Mad Libs and Perplexis. Though I think that most of the adjectives and verbs for the Mad Libs were words like "poop", and "fart". Yea, we were the same way when we were that age weren't we! About half way to Madison, we stopped for dinner at Subway. Somehow I had the feeling that this wouldn't be the first trip to Subway on our 2 week journey. We made it to the America's Best in Madison. They let us have extra kids in the room as we had blow up beds for them. Holy cow, this room was the smallest hotel room I have ever seen. Two double beds right up against 2 walls with a small walking space inbetween. No room on the edges. It was almost comical to have 7 people in that room. We all fit and despite freezing the 2 kids on the floor, all slept fine. The room may have been small but the breakfast the next day was awesome. I should have taken pictures, sorry. They not only had waffle makers, but a pancake station and an omelet station. Fried potatoes, sausage and gravy. Fruit and whipped cream for the waffles along with the usual cereal, toast and bagels. It was impressive and we left the next morning stuffed. Our next stop was The Jelly Belly factory in Pleasant Prairie, Wisconsin. This place was a hoot! They give a free tour of the warehouse. You get to wear a cute paper hat, unflattering but still cute. They we rode around in a little train and heard details about the history of Jelly Bellys and how to make those delicious little sweet beans! We then enjoyed the gift shop, eating samples that included the flavors; Sausage, Grass, Toothpaste and Rotten Egg. My son, Jacob, tried the Rotten Egg flavor. Why, I asked. Why?? We bought a whole bunch of candy for the road and a few gifts as well. We even bought their package of Beanboozled Jelly Bellys. They have all the funky weird flavors that I will let my kids enjoy. 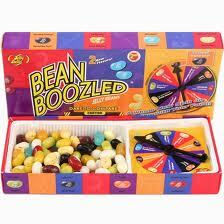 You might get a normal flavor or you might get stuck with flavors like earwax, pencil shavings or boogers. I'll stick with flavors that I recognize. Next it was off to drop off the extra kids with Grandma. We were meeting her at a McDonald's about 40 minutes from where she lived in Illinois so we wouldn't be going too much out of our way. We followed the Mapquest but then it got all wonky on us. We ended up finding 2 McD's before we found the one that we needed. No worries, it turns out that we pulled in exactly the same time as grandma. We ate lunch and the kids all said goodbye. We'd be picking them up in 2 weeks! After repacking the van, now that we had more room, we were off to Sandusky, Ohio. The trip was going fine until we ran into some weather. We thought at one point that we were outrunning the storm but it quickly enveloped us and started pouring buckets all over. We even pulled over under a bridge at one point it was raining so hard. The weather was hot and humid - VERY hot and humid. You know what that often means in the midwest, don't you? Tornado weather. My kids were already freaked out by the storm so I didn't mention this but both my husband and I were watching the sky and a little freaked out ourselves by the storm. It all turned out well and we made it to the hotel. I tried to check in but was told by a very nervous man in the front that there was a problem with cleaning several of the rooms and he was waiting to hear from the other employee if the rooms were ready. It didn't seem like it would be a long wait so I told him it was okay. Another woman was not so patient. She was on the phone with a whole bunch of people trying to get some answers to why she didn't have a room. She used up so much energy and was so angry yet there was nothing she could do about the situation. Why do people do that? It doesn't help to get angry. It was a slightly frustrating situation but there was no reason to yell and make such a fuss. At least I was able to turn it into a teaching lesson for my kids. I reminded my kids that there is no sense getting all worked up and complaining when there is nothing you can do about the situation. Just go with it and make the best of it. After all, we were on vacation! I was not about to get upset! We ended up waiting a whole 10 minutes and then got a room. You know what I forgot about though? The time change. We were now on eastern time. When did that happen?